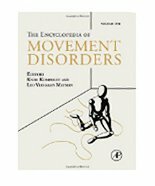 The Encyclopedia of Movement Disorders is a comprehensive reference work on movement disorders, encompassing a wide variety of topics in neurology, neurosurgery, psychiatry and pharmacology. This compilation will feature more than 300 focused entries, including sections on different disease states, pathophysiology, epidemiology, genetics, clinical presentation, diagnostic tools, as well as discussions on relevant basic science topics. This Encyclopedia is an essential addition to any collection, written to be accessible for both the clinical and non-clinical reader. Academic clinicians, translational researchers and basic scientists are brought together to connect experimental findings made in the laboratory to the clinical features, pathophysiology and treatment of movement disorders. The Encyclopedia targets a broad readership, ranging from students to general physicians, basic scientists and Movement Disorder specialists. Published both in print and via Elsevier's online platform of Science Direct, this Encyclopedia will have the enhanced option of integrating traditional print with online multimedia.